I love reading books in Scots, whether that be for my own enjoyment, reading to my own children or to a class or group. It is a wonderfully expressive language and the vocabulary is just fantastic, making it a joy to read. Given what a wonderful language it is, I though I would share some of my favourite Scots translations. These are just a few that are out there, there are loads more! So many of Julia Donaldson’s wonderful rhyming picture books have been translated into Scots that it’s not really fair to pick just one! I love the various Gruffalo translations, Room on the Broom in Scots, The Troll and the Kist o Gowd and all the others. But I do have a soft spot for The Revier Rat. The Highway Rat is a fantastic wee story about the rat who learns that you reap what you sow. The Scots translation is full of wonderfully expressive vocabulary, making it a joy to read aloud. Perfect for young audiences. I have made no secret about how much I love Diary o a Wimpy Wean. It is as hilarious as the original but with a Scots twist. The dialogue is so real and relatable that children can easily identify with the characters. Ideal for older primary children and upwards. This is a book about poo. If that is not your thing, then this might not be for you! However, for everyone else this is a hilarious wee tale about the mole who goes in search of the creature that has keeched on his head. My 4 and 6 year old absolutely love this book and fall about laughing every time we read it. Brilliant for introducing Scots vocabulary as we go through meeting an array of animal suspects. I was so excited when this was released a couple of years ago and I was not disappointed. I am going to confess, I have never been a big Harry Potter fan but the Scots edition blew me away. It has been expertly translated by Matthew Fitt and it is a really fantastic read. Great for expanding vocabulary -it introduced me to some new words (clishmaclaver has become one of my favourites!) It is pretty challenging, however. Definitely upper primary and older. I love all of the Roald Dahl translations although some are quite challenging, like The GFG. The Eejits is one of the more accessible. Again, the vocabulary is brilliant and it is a great book for reading aloud. This is another great one for reading aloud and getting your audience to join in! Brilliant for encouraging younger readers to use Scots vocabulary and plenty of scope for actions and movement. A firm favourite! This graphic novel adaptation of the classic novel, Kidnapped, is a beautiful book and the Scots translation is brilliant. I am a big fan of graphic novels and this is a great one for older children. I love David Walliams book. I think they are fun, accessible and entertaining and the Scots translations are no different. I think my favourite has to be Mr Mingin, the story of Chloe and her new best friend, Mr Mingin. It is very funny and full of wonderful Scots vocabulary for readers to enjoy independently or to listen to. Who doesn’t love Tintin? Another brilliant graphic novel translated into Scots. It can sometimes feel a bit daunting to be faced with pages of unfamiliar looking text (in Scots or otherwise) and graphic novels feel a little less scary. Another one for older children to delve into. Everyone knows the story of The Tiger who Came to Tea which makes this a great book to explore some Scots vocabulary with. It is a beautifully illustrated book that is ideal for young readers. Again, scope for acting and recreating scenes. One of my favourites. As I said there are loads of excellent children’s books in Scots, so go and explore what’s out there and enjoy! A Pinch of Magic is an extraordinary, beautiful and mesmerising tale of 3 sisters who are touched with a little bit of magic. It is, without a doubt, one of my favourite books of recent years and one that I could not put down. It tells the story of Fliss, Betty and Charlie – 3 very different natured sisters – who have lived with their granny in Crowstone their whole lives. While older sister Flies appears to have accepted this, Betty is desperate to explore what lies beyond. From then on we are thrown into a world of mystery, enchantment and new discoveries as the girls fight to break an ancient curse which prevents them from leaving Crowstone. The girls are given 3 magical objects, passed down through generations of Widdershins women and this ‘pinch of magic’ and their sheer resolve and determination set them on their path. What I loved most about this book was its amazing array of strong, resilient, determined, female characters. The sisters themselves are very different personalities but their individual strengths all shine through and their bond is central to the story. A Pinch of Magic had me hooked from the start. It is an enchanting, magical, powerful story about family, resilience, determination and hope which I absolutely loved. If you have not read it, make it your next choice. You will not be disappointed! I loved reading this charming rhyming picture book with my 4 year old. Timothy Mean and the Time Machine follows Timothy’s adventures as he travels through the ages in his newly built time machine. From Vikings to dinosaurs, the moon landing to a future where cars can fly, our intrepid hero takes us on an epic journey through time and through his imagination. I absolutely adored this clever rhyming story and the central character of Timothy – a somewhat cheeky, imaginative adventurer. Young children will love joining in with the rhymes and, if they are anything like my youngest, will want to read it over and over again! The illustrations by Marcello Simonetti are absolutely wonderful and add immensely to the unique charm of the book. They are so full of detail and expression that there is always lots to look at and discuss as you read through the book. Timothy Mean and the Time Machine is a delightful, warmhearted tale of adventure and where your imagination can take you. I really enjoyed this lovely wee story and I am sure it is destined to become a firm favourite in this house! Definitely recommend. When I picked up The Darkdeep I was unsure what to expect. I had heard nothing about it or its authors, Brendan Reichs and Ally Condie. However, it turns out I was not disappointed. The Darkdeep is, without a doubt, one of the most exciting and thrilling novels I have read this year. It is a tale of friendship and adventure – the story of a group of children finding their way, their friends and themselves. An accident at spooky Still Cove leads Nico and his friends on a journey on which they discover a hidden island, an abandoned house boat and a series of strange goings on. And all the while something unknown lurks beneath the water. There is so much about The Darkdeep that I absolutely adored. It is the epitome of childhood adventure with strange phenomenon, secret tunnels and mysterious creatures bringing back memories of watching films like The Goonies as a child. The characters are spot on – believable and relatable. The authors cleverly ensure we see the multiple layers of each of the children, allowing the reader to empathise with every one. The Darkdeep is a captivating and exhilarating story of friendship and adventure. Older children (and adults like me!) will find it impossible to put down. Much like the mysterious water it refers to, The Darkdeep grips hold of you, pulls you in and doesn’t let go until it spits you out gasping for air at the other end. I loved The Darkdeep. It is an absolute must read and I cannot wait for the sequel! Guardians of the Wild Unicorn is fantastically enchanting and exciting adventure story that absolutely grips you from the first page. Set against a real and familiar background, it is a believable and engaging tale of friendship, human nature and magical unicorns. Set in the Scottish Highlands, it is the story of best friends Lewis and Rhona who have travelled from their Glasgow homes with their classmates on their Primary 7 residential trip. While Rhona embraces the outdoor activities, Lewis is far more reluctant and he begins to wish he was back at home. That is until he discovers that there are wild unicorns living on the estate and they are in grave danger and desperately need help. Together Lewis and Rhona make it their mission to rescue the legendary creatures, learning a lot about themselves and each other along the way. There is something about The Guardians of the Wild Unicorns that is very real and the characters are so honest and relatable. Children will be able to recognise little things about themselves (and their teachers!) in the main characters. I loved the use of Scots in the dialogue which adds to the authentic feel of the book, as do the beautiful Gaelic names of the unicorns. It would also be a brilliant book to use with a Primary 6 or 7 class who are going on their own residential trip and Lindsay has produced some excellent teaching resources to accompany the book. 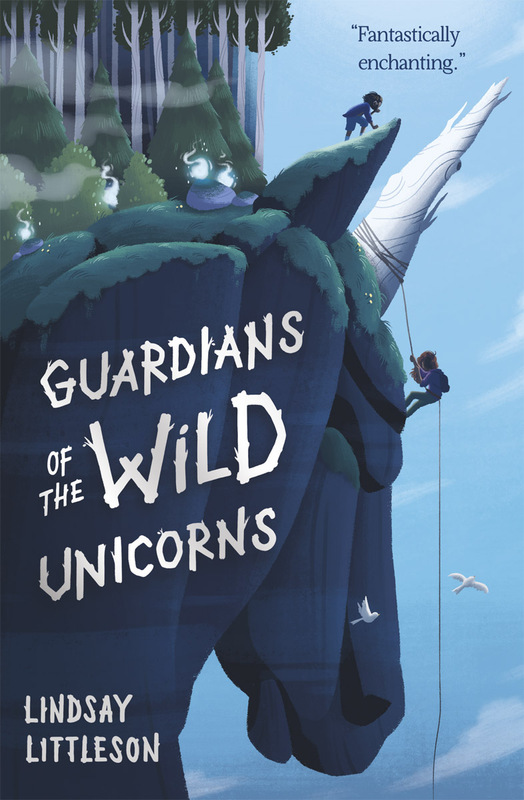 In Guardians of the Wild Unicorns, Lindsay Littleson has created a wonderfully honest tale of friendship and self-discovery. It is fantastic adventure and a powerful novel which I absolutely loved! Monsters Unite is a lovely thought-provoking picture book tale from Molly and Sara Sheridan which is filled with beautiful illustrations by Iain Carroll. It tells the story of Nessie who is feeling a bit sad. She is too big to travel along the rivers like her fishy friends and she longs for adventure. While many visitors come to see her and take her photo, nobody stops to say hello and she feels rather lonely. However, when she discovers a secret Monster Tunnel Network everything changes and she sets off on a journey of exploration and adventure, meeting an array of international new friends along the way. Monsters Unite has a really powerful message at is core about what can be achieved when we work together, help each other and embrace and celebrate our differences. It is also serves as an importance lesson to us all about the devastating impact that discarded plastic waste is having on our rivers, lochs and oceans as Nessie and her friends battle to repair her collapsed tunnel, a message that is incredibly relevant today. On a simple level Monsters Unite is a fabulous, fun, entertaining story that children and adults will adore. The illustrations are utterly fantastic and full of so much detail that you can spend ages exploring and discussing the drawings alone. It is a marvellously enjoyable story for young children that has many layers to unpick. It is a story that children will want to read again and again and that adults will be delighted to keep revisiting. Highly recommend. Isla, Buzz and Gracie love looking after animals and have their own club with its own code of conduct and mission statement, ‘to take care of ALL living creatures’. Three afternoons a week they help out at their local nature reserve where they learn all about caring for different animals and their environment. One day they come across a trapped and injured baby deer and helping the little fawn becomes their goal. However, when new girl Lexi wants to join their club their resolve is tested when she acts like she knows everything and shows a disregard for her surroundings. The Baby Deer Rescue is a really charming story of friendship and compassion which reminds us that first impressions are often misleading and it is always important to show kindness to others. It is a heart-warming novel that will appeal to younger readers who love animals! There is a super wee information section at the back which provides facts and information about different creatures and gives excellent suggestions of ways to get involved. Overall, I loved this delightful wee story and I am really looking forward to the next instalment, The Baby Otter Rescue.